One of my pet peeves in baseball is when an announcer mentions a stat without giving any context. It’s lazy and misleading and it’s usually done with counting stats. For example, both A.J. Pierzynski and Prince Fielder have grounded into 19 double plays this season, but Pierzynski has done it in 60 fewer opportunities. Opportunities are defined as plate appearances with a runner on first with less than two outs. Why do opportunities need to be considered? Not all plate appearances are created equal. Lead-off batters are guaranteed to have one plate appearance per game that will not end up in a double play. Teams with high on base percentages as a whole, will have more opportunities because they have more players reaching first base. Players in the 2/3/4/5 spots in the lineup will have more opportunities because the hitters in front of them will reach base more often (assuming proper lineup construction). 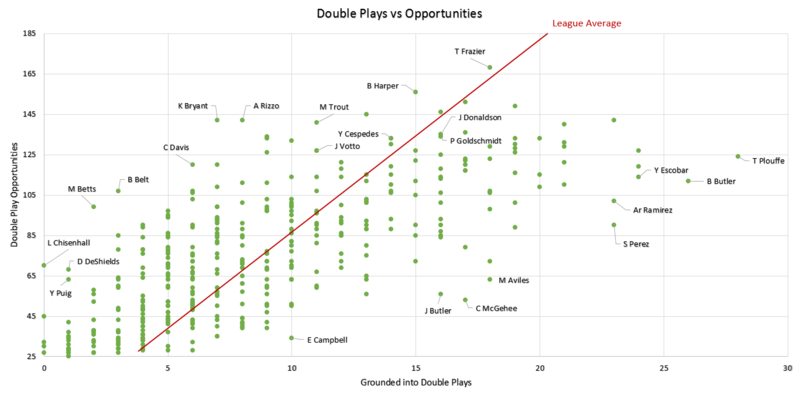 To show this graphically, I decided to make a scatter plot for double plays and double play opportunities. It includes all players with at least 25 opportunities this season. The red line shows the league average double play rate, which is around 11% of opportunities. Basically, the farther away from the line to the top left, the better the player has been at avoiding double plays. Conversely, the farther from the line to the bottom right, the worse they are. I added labels for the biggest outliers and most notable offensive players. – Left-handed. Left-handed batters are a few feet closer to first base, so their time to first is, on average, shorter. – Speed. This is simple. Faster players will beat out more throws to first than slower players. – Flyball hitters. Fewer ground balls, fewer double plays. – High strikeouts: You can’t ground into a double play if you don’t put the ball in play. – Lonnie Chisenhall has had 70 opportunities and has yet to ground into a double play. – The Cubs Rizzo and Bryant have combined for 284 opportunities and have grounded into 15 double palys (8 and 7 respectively). Compare that to Yasmany Tomas who has grounded into 15 double plays in just 72 opportunities. – It’s no coincidence that the games best hitters (Trout, Harper, Donaldson, Goldschmdit, Votto, etc are all at league average or better. Suppose the World Series winner from the previous season held a championship they had to defend every game, sort of a “championship belt”. I’ll call this the “traveling championship”. Once the traveling champion loses, the championship is then transferred to the team that beat them. Then, that team goes on to defend the title. This goes on until the end of the regular season and the last team to hold the title is the “Traveling Champion”. Is the “traveling champion” the best team? It’s fun, or at least I think it is. Luis Tiant turns 74 years old today. So I thought I’d share this description of his ability to kill time on the mound, by Roger Angell in Five Seasons. Game then runs down, stops, dies, thanks to Luis Tiant, Bost. pitcher. Tiant, noted for odd pitching mannerisms, is also a famous mound dawdler. Stands on hill like sunstruck archeologist at Knossos. Regards ruins. Studies sun. Studies landscape. Looks at artifact in hand. Wonders: Keep this potsherd or throw it away? Does Smithsonian want it? Hmm. Prepares to throw it away. Pauses. Sudd. discovers writing on object. Hmm. Possible Linear B inscript.? Sighs. Decides. Throws. Wipes face. Repeats whole thing. Innings & hours creep by. Spectators clap, yawn, droop, expire. In stands, 57 disloc. jaws set new modern AL record, single game. Somebody wins game in end, can’t remember who. The book covers the 1972-1976 seasons, and this particular description comes from a Red Sox/White Sox game on June 7, 1972. The actual game is of little importance to the quote above, but it should be noted that this 2-1 White Sox victory finished in just 2 hours and 42 minutes. Maybe because Tiant only pitched five innings. Just a quick post on how much of a roller coaster the Red Sox have been on over the past few years. The 2012 Red Sox had the lowest winning percentage of any team that would go on to win the World Series the following season. Not only that, but the 2014 Red Sox had the second lowest winning percentage of any defending World Series winner. Only the 1998 Marlins were worse and we all know that story. Not to mention the 2011 season, after being considered an all-time great team going into the season and then the epic collapse after being up 9 games in the wild card with less than a month to go. It truly has been a wild ride in Boston the past few seasons. With the reports of their willingness to spend money on free agents this offseason, it’s not unreasonable to expect them to be a contender again in 2015.